Answering multiple choice questions doesn't have to be drudgery! 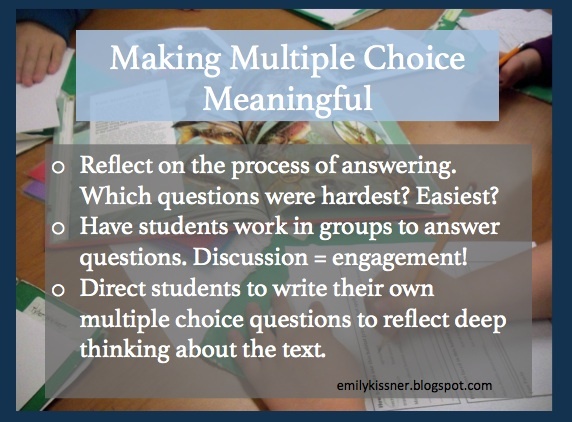 In fact, multiple choice questions can have a place in an engaging ELA classroom. 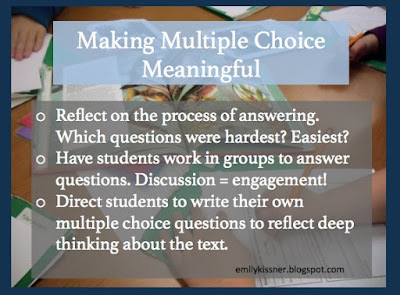 Getting kids to talk more about multiple choice questions helps them to move beyond "right/wrong" thinking and into looking more deeply at the text. Reflect on the process of answering. Which questions were hardest? Easiest? This is a great place to begin. I like to have students put a star beside the one that they think would be hardest, and a circle by the one that they think is easiest. Now here's the interesting part: Why? Listening to students talk about their choices reveals so much about their thinking. This works best with the really tough multiple choice questions, and when students feel comfortable with each other. As my students did this last week, I enjoyed circulating to listen in on conversations. In one group I heard a student timidly offer a (correct) answer, only to be overruled by the group. I called the student aside about a seemingly unrelated issue--and then I said, "You were right for #1! Why didn't you stand up for your answer?" It was neat to watch how the student returned to the group and re-started the conversation! Some kids hated the questions in the item sampler, and it was easy to see why. Listening to them grumble good-naturedly about the wording of the questions was kind of fun for me. The second part of this is the most important, because it is what provokes discussion. What is "deep thinking"? And how can we craft questions to reflect it? 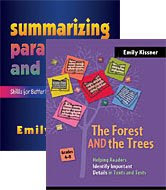 It's been nine years since I wrote a book about summarizing, and I keep feeling like I learn more and more. This year, as I've moved back into sixth grade, I decided to start the year with frequent summarizing tasks. I'm teaching summarizing, but I feel like I'm the one who is learning lessons! This year's summaries are based on a set of four expository texts about water. Each text has a similar structure and text features. My goal was to build on repeated experiences and frequent feedback to level up my students' summarizing skills. Here are some of the things that I have learned (and re-learned!) so far this year. Conscientious sixth graders want to do well! In many cases, this means that they write summaries that are almost as long as the original text. There are two different profiles for the writer of the long-winded summary. On the one hand, you'll see kids who are proficient readers and have a large working memory produce these summaries. They just have a big capacity for details, and they understand everything in the text. 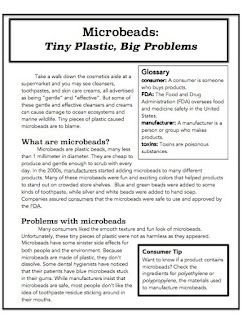 On the other hand, some kids who are struggling but conscientious will create these summaries. They're not sure of which details are most important, but they want to please the teacher and so they put them all in. My problem when I get these summaries? I'm too soft-hearted! These kids have obviously worked hard, and at the start of the year it's tough for me to hand them back for the kids to redo. When I provide limited space for the summary, though, I let the lines do the heavy lifting. "Make sure your summary fits in the space," I say, and when kids ask for extra paper, I give them a small sticky note. How much space should you provide? A good rule of thumb is to think about how much room it would take to write a sentence for each paragraph, and then add 3 or 4 more. This gives kids with big handwriting enough room to write a good summary without going overboard. Some students look at the article and think, "I can never summarize that!" In many texts, though, kids can use the headings to guide them through. This is especially helpful for chunking a summarizing assignment for students with learning disabilities. "Don't worry about the whole thing today," I tell students. "Let's just do this first chunk." This also helps students who tend to summarize in a knowledge-telling fashion. These students write everything they remember about the text, in the order in which they remember it. A summary written like this tends to sound like a list of random facts instead of an organized summary. By reminding students to go back to the text, you can give them an anchor for their thoughts. 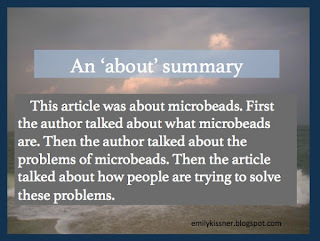 Around about the third summary I start to see the topic-based summaries creeping in. Students are becoming more efficient with their summarizing and decide to take a shortcut. These are actually signs of good progress. Usually, I end up writing about twenty times: "Don't say what the article was about--actually include the information!" Once kids see the difference, they realize that the 'about' summary is quite empty of actual facts. 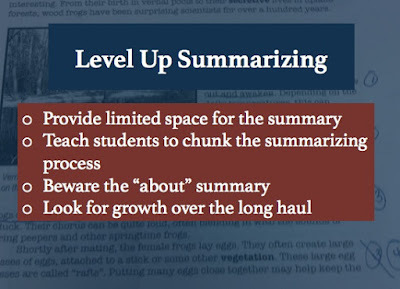 The development of summarizing skill is a long process. As readers grapple with more and more complex texts, they need to see how they can wrestle ideas to the page to write a summary. Students won't necessarily become strong summarizers after one lesson, or two, or even three. However, the good news is that repeated summarizing can build comprehension as well. I like to think of teaching summarizing as test-prep I can live with!